Who are NOS and WTF? NOS is one of the biggest telecommunication companies operating in Portugal. In order to answer the needs of youngsters like you, NOS created WTF: an exclusive brand and mobile plan for everyone under 25 years old. 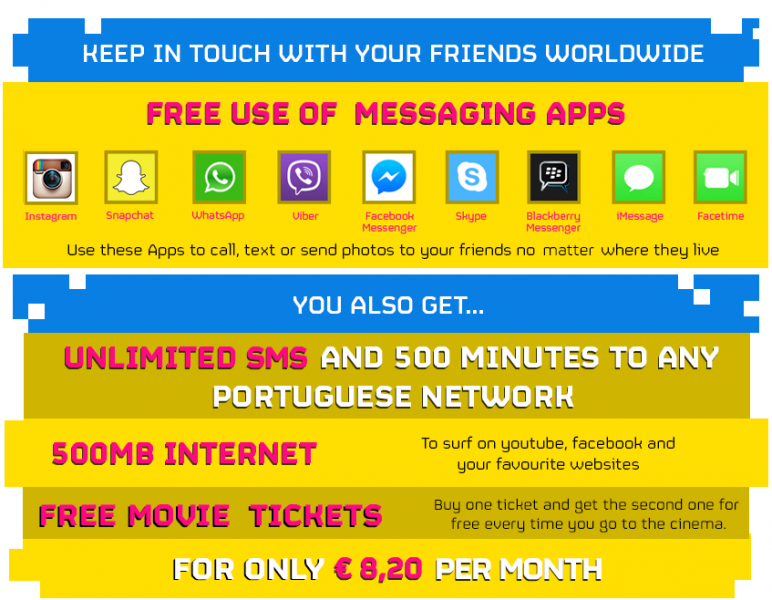 WTF includes everything you need to keep in touch with your friends and family back home and to make the most of your stay here in Portugal. How do you start using your WTF card? 1) To have access to these conditions, you need to activate your SIM card by placing it inside your phone. Then you will receive an SMS (it will be in Portuguese for you to start practicing our language asking you to access the link welcome.wtf.pt in order to choose your WTF mobile plan (W, T or F), as you can see below. The only difference between them is the amount of internet included, so feel free to choose the one that best suits your needs. [Important]: in case you don’t have a smartphone you will have to call 12060 and follow these steps by phone. If you don’t speak Portuguese we recommend you to ask someone for help. 2) After you complete the first step, you will receive a text message asking you to answer it with your passport or student card number. Answer it so you can continue using your WTF card. 3) Finally, you must top up your card at any NOS store or ATM machine with at least €8,20, €10,50 or €15,50, depending on the WTF mobile plan you have chosen. This top up will enable you to use your WTF card for one month. 30 days after, you must top up again. Don’t forget that there is an exclusive promotion for Erasmus students: every time you top up €10 or more (at once) you get a bonus of €2,50, which you can use as you wish. 4) Until March 31st all the WTF mobile plan will be witheven better conditions: 10 times more internet! • You can always check your WTFcard status (current amount of € on it, available internet MB…) by dialing *111#. Where can you get your WTF card? The SIM card should be included in your Welcome Kit. Otherwise, just ask your friends from ESN section for it.